The Grateful Dead might be saying a final goodbye, but fans can still hear a whole lot more of the jam band's legendary live shows. This is thanks to an absolutely massive new box set called 30 Trips Around the Sun. Due out on September 18 on Rhino Records, the set is made up of an incredible 80 CDs. It contains 30 live concert recordings, one for each year that the band toured (1966 to 1995). All told, there are more than 73 hours of music. When we began discussing audio projects to commemorate the 50th anniversary of the Grateful Dead back in 2012, we knew we wanted to do something completely unprecedented. We could think of nothing more exciting or ambitious than a career-spanning overview of the band's live legacy focused on what best tells the story: complete concerts. Our first criterion was the very best live music to represent any given year in the band's history. We wanted to make sure that there were not only the tent-pole shows that fans have been demanding for decades but also ones that are slightly more under the radar, but equally excellent. 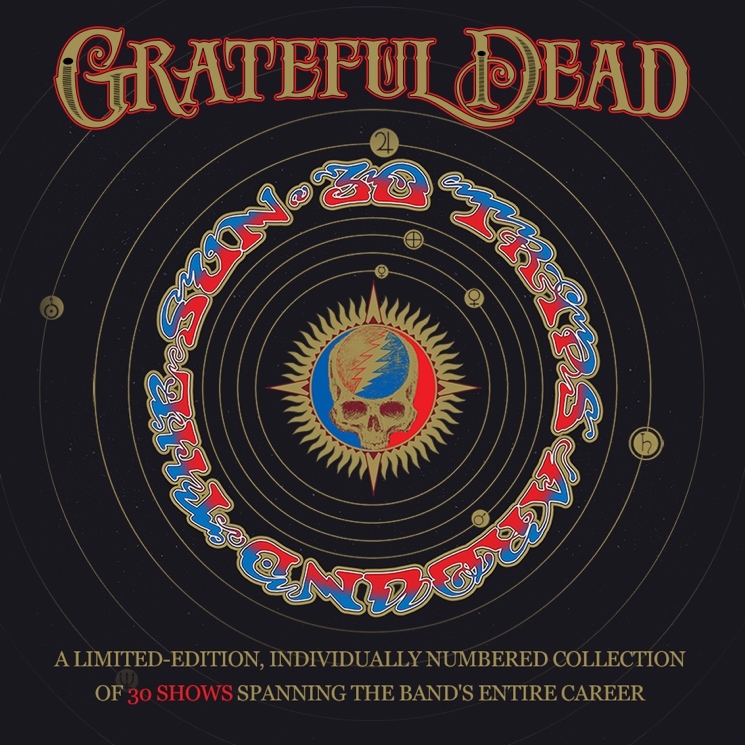 For those who listen to the entire box straight through, chronologically, the narrative of the Grateful Dead's live legacy will be seen as second to none in the pantheon of music history. At the bottom of this page, watch Lemieux speak about 30 Trips Around the Sun. The box set will be available in an edition of 6,500 numbered CD sets or 1,000 lightning bolt-shaped USB drives. The CDs come with a bonus 7-inch (containing a song from a 1965 recording session, plus the band's final-ever live song from 1995), a 288-page book (with an essay by Nick Meriwether and fan-submitted remembrances), and a scroll with a visual depiction of the band's live evolution. It retails for $699.98 USD ($867.41 CAD). For those who don't want to splurge for the full set, a four-CD comp called 30 Trips Around the Sun: The Definitive Live Story 1965-1995 will also be available. This will contain one song from each of the 30 shows in the box. The set can be pre-ordered right here; a few songs from the package can be heard of at the same website, and the dates of some of the shows contained in the box have been revealed. Meanwhile, we're still waiting for that Martin Scorsese-produced Grateful Dead documentary to emerge.